The first night of my weekend is usually a treat night after munching on soups and casseroles all week. 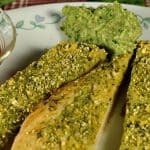 At that usually means pizza – but last night I decided to change things up a bit by making these Avocado Pesto Breadsticks instead, with a bowl of my Fat Free Pizza Sauce for dipping. And with leftovers to snack on during the big game today? 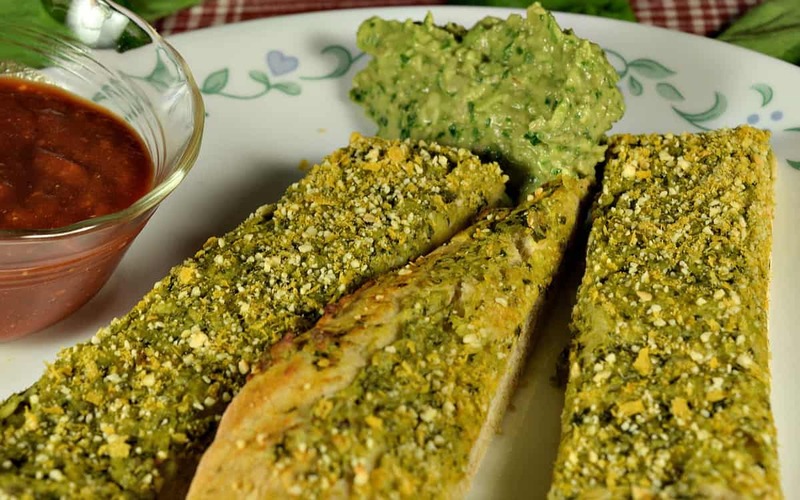 Warm, chewy, breadsticks smothered in an Avocado/Basil Pesto, with a generous sprinkling of my Vegan Parmesan. Now traditional Pesto is made from Basil and Olive Oil, so I made this a bit healthier by leaving out the oil and using an Avocado instead. I also added a handful of Kale (just for a nutrient boost) and some toasted Pine Nuts to make this extra rich and yummy. 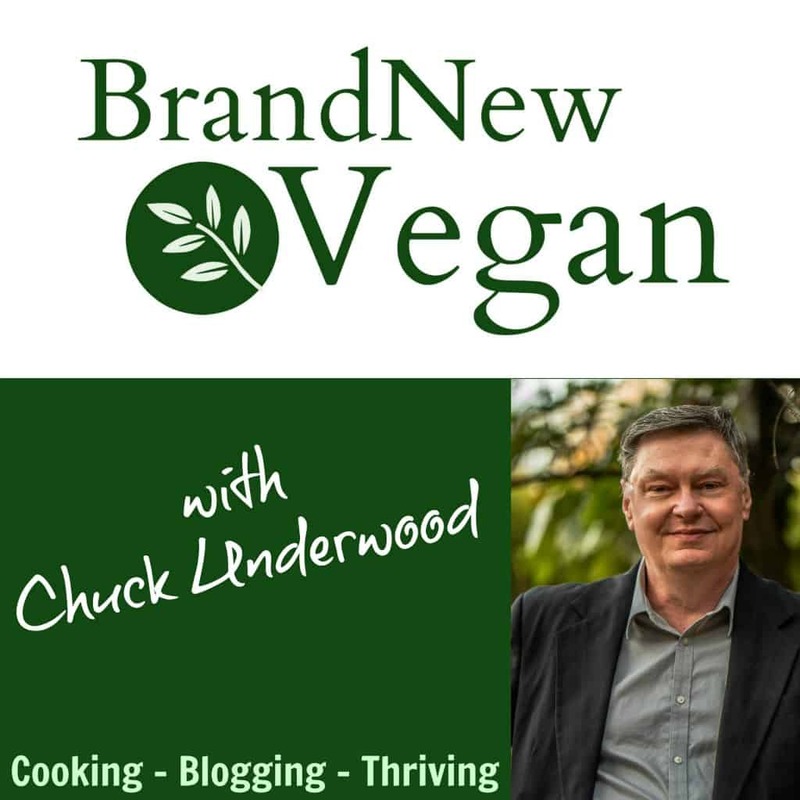 Yes, there is a bit of fat in this recipe so it’s not exactly a snack I would recommend eating every day of the week (as much as I’d like to) ….. but for parties, potlucks, or the occasional treat night? The crumbly Parmesan Topping you see is simply a mixture of ground Cashews, Nutritional Yeast, Garlic Powder, and a little salt. You can find the instructions here in my Pizza Stuffed Potatoes recipe. If you want a red sauce for dipping, you could either use a good Marinara Sauce , or a Pizza Sauce. This makes enough dough for 2 batches of breadsticks, or 2 pizzas. Heat 1 ½ cups of water in the microwave for about 50 seconds. Perfect temperature for proofing yeast. Now add 1 Tbls Sugar and 2 ¼ tsp of active dry yeast and let that sit for about 10 minutes or until it’s nice and bubbly. Add 1 tsp of salt, 1 tsp of Italian Seasoning, and then 1 cup of bread flour. Mix thoroughly. I cheat and use my Kitchen-Aid Stand Mixer with the paddle attachment. Add another cup of bread flour and ¾ cup of whole wheat flour. Mix on medium speed until all the dry flour is incorporated. Cover and let that sit for 10-20 minutes. Finally with your dough hook, mix in another ½ to ¾ cup of bread flour, until you have a nice tight dough ball. Cover with saran wrap and a kitchen towel and place in a cold oven to rise for 1 hour. Now here’s a trick to get the right temperature for your dough to rise. Turn on your oven, any temperature will do, for just 1 MINUTE, then turn it off. Just enough heat will build up in that minute to double our dough over the next 60 minutes. Don’t forget to turn off your oven! 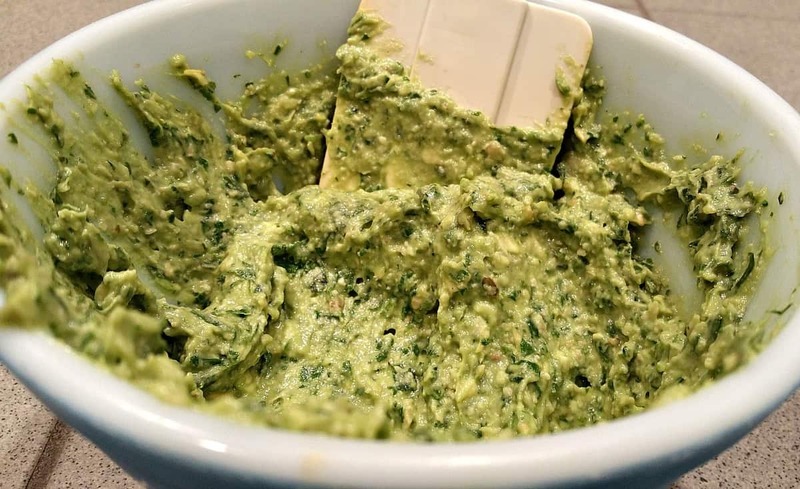 While the dough is rising, we can make the Pesto. 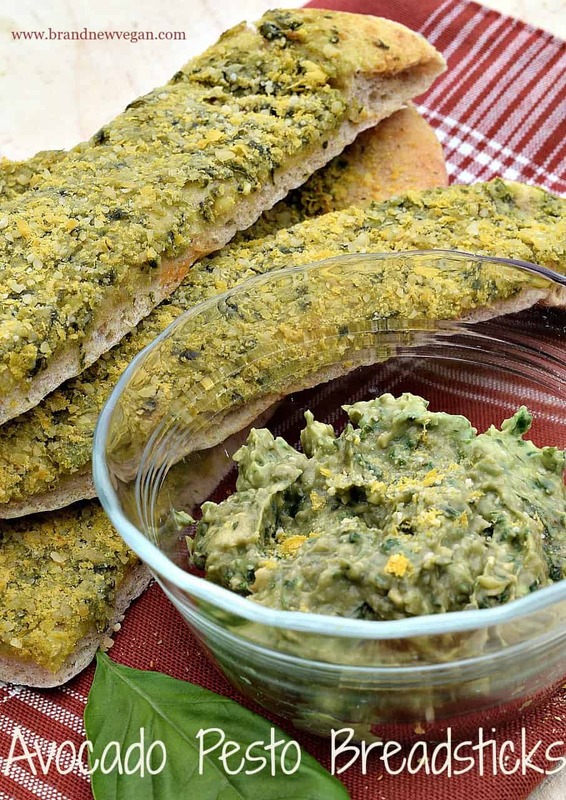 This Pesto is super easy to make with a food processor. Just add all the ingredients and pulse until creamy. Be sure and pause occasionally to scrape down the sides of your food processor. Keep pulsing until it’s smooth and creamy. I added toasted Pine Nuts as well as they really add a nice flavor, but can be omitted if you can’t find them. If you do use them, toast them in a dry frying pan for a few minutes over low heat until they start to turn brown. Once the dough has risen it’s time to make our breadsticks. On a floured surface, scrape the dough onto your work area and with floured hands, work the dough a bit, just enough so it’s no longer sticky. It should be smooth and stretchy. 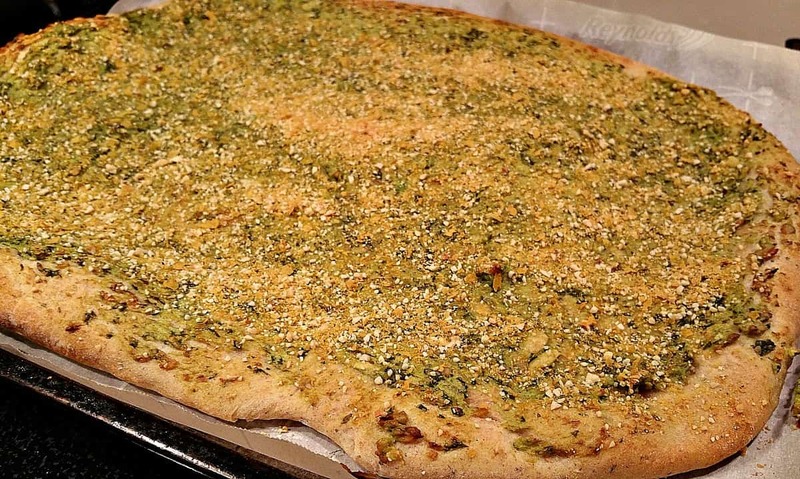 Roll out your remaining dough ball to cover a rectangular baking sheet. Parchment paper helps to avoid sticking. Now spread a generous layer of pesto and sprinkle with the Parmesan Cheese mixture. Bake in a 450° F oven for about 15 minutes. I used Pizza Sauce and the leftover Pesto as a dip. Warm, chewy Avocado Pesto Breadsticks slathered with a rich oil-free Pesto and topped with Vegan Parmesan. The perfect dipper! Sprinkle with Parmesan and bake for 15 minutes at 450 degrees F.
We made it into pizza, added tomatoes and artichoke hearts and olives. Husband declared it best pizza he’s had in years ! Great recipe! Looks wonderful… Can’t wait to try these. Can you tell us after dividing the dough for pizza and bread sticks, about how many bread sticks will this make? Made these to go with gnocchi and they were delicious. I actually used all whole wheat flour for the dough because that’s all I had, and they turned out amazing. Will be making these again soon!